Armish Garg, CFA has over 12 years of experience in performing business valuations. 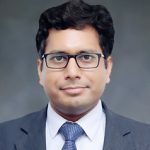 He has performed a variety of valuation and consulting engagements including the valuation of complex instruments, valuation of operating businesses, investment holding companies, non-controlling interests, purchase price allocations, mergers and acquisitions and other corporate finance consulting engagements. He has experience in valuing companies across industries including logistics and supply chain, healthcare, manufacturing, distribution, retail, e-commerce, consumer goods, hospitality, and power and energy infrastructure, among others. He has performed valuation assignments for many purposes, including financial reporting, gift and estate tax reporting, commercial, estate and matrimonial litigation, regulatory compliance, transaction advisory, mergers and acquisition, and financial restructuring. His technical skills include the valuation of complex capital structures through the application of option pricing models such as the Black-Scholes model and Binomial models to determine relevant share class values. He also has experience preparing financial models, investor pitch decks, and information memorandums for fundraising or merger and acquisition transactions. Mr. Garg is a Chartered Financial Analyst with the CFA Institute. He also holds the Chartered Accountant designation with the Institute of Chartered Accountants of India and holds a bachelor’s degree in commerce.